Ethyl alcohol (or ethanol). Found in high concentrations in alcoholic beverages. 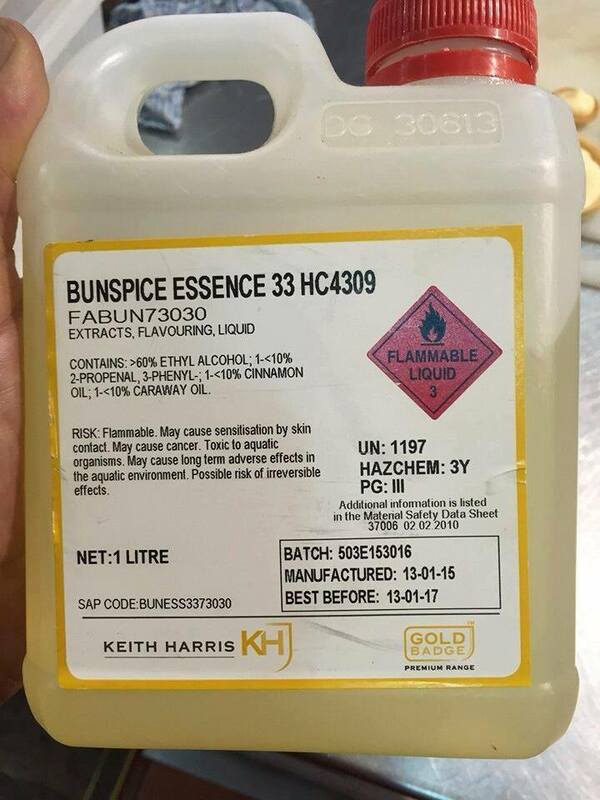 There’s your “horrendous chemical” flammable carcinogen right there. The vast majority of it will be gone after baking but there may be tiny amounts left in the food item. Remember, the dose makes the poison! You’d have to stop eating mum’s homemade Christmas cake and also loads of fruit and vegetables with naturally occurring ethanol if we ignored this essential common sense! But sure, if you felt like chugging down the whole bottle of this stuff, then you might want to read the label first. 3-phenyl-2 propenal. Sounds scary (maybe like deoxyribonucleic acid = DNA!) but it’s just cinnamaldehyde, a pale yellow, viscous liquid that occurs naturally in the bark of cinnamon trees. Cinnamon and caraway oils. Lots of hard-to-pronounce chemical names in there if we go looking. Yep, naturally occurring compounds have some crazy names and complex chemical structures! Some of the most complex chemical structures are naturally occurring and scientists can spend their whole lives trying to synthesise them for noble purposes such as finding a cure for cancer for example. On the other hand, one of the most simple naturally occurring chemicals, ammonia (NH3) (once we figured out how to synthesise it) was responsible for both a huge number of tragic deaths during the holocaust, but was also responsible for saving lives when used as a fertiliser. How’s that for food for thought? It’s good to view mass produced foods with a critical eye, but we must be wary of scaremongering such as that pictured below. Pages that spread ideology such as this do nothing to ensure we eat more safely. They are anti-intellectual at best and damaging to critical thought and natural enquiry at worst. ← Organic Chemistry for GAMSAT: where to start?